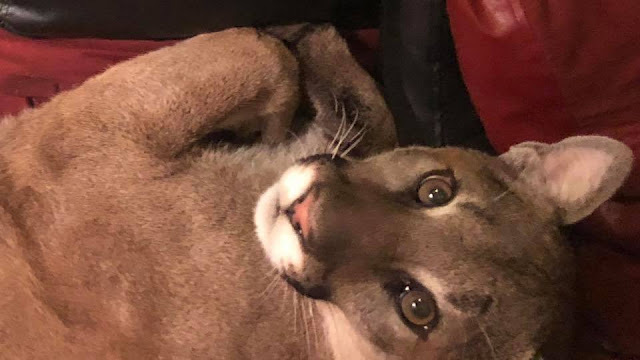 What would you do if a mountain lion sought refuge in your living room? If you’re Facebook user Lauren Taylor, you apparently use telepathy to calm down the animal and make sure it has a comfy place to take a nap. 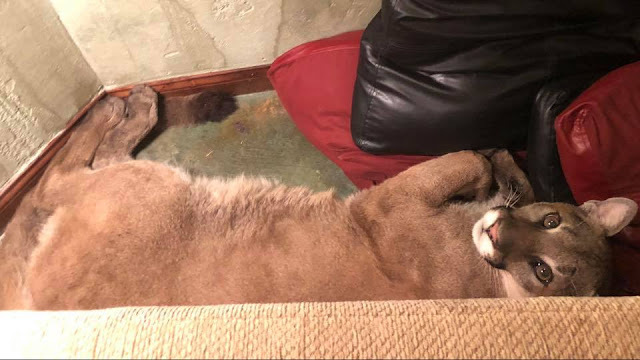 Earlier this month, while apparently trying to seek refuge from wildfires in Oregon, a mountain lion entered Taylor’s home after drinking from her fountain outside of her back door. According to Taylor, the cat tried to leave through a closed window after somebody in the house screamed and then hid behind the sofa. Cats are extremely psychic and perceptive of energy and this lion could have been dangerous in an energy field of fear or anger. 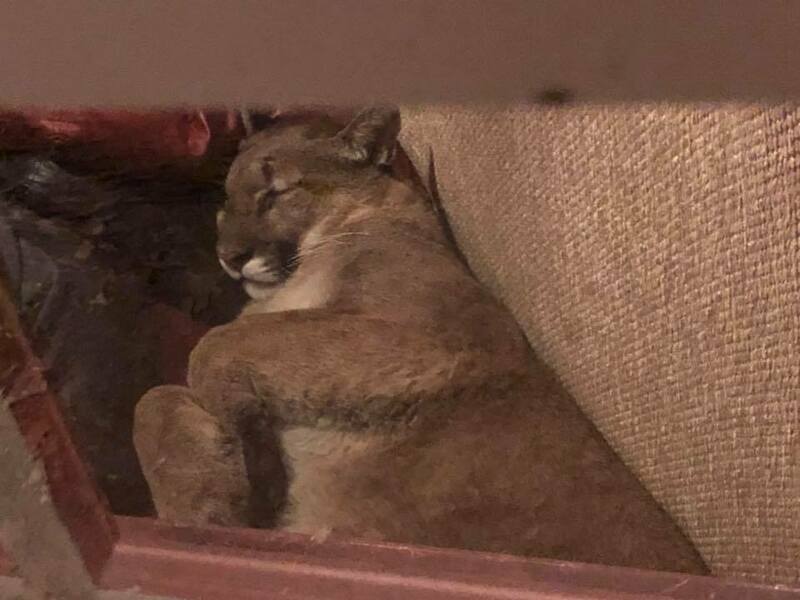 In fact, before I consciously elevated the energy field and entrained her to a theta state, a housemate had shouted and slammed a door upon seeing her and the lion was frightened, agitated, and determined to exit through a closed window. Once the energy shifted, she calmed down. When she was so quiet and it was obvious from the position of her feet on the wall that she was laying down, I went outside to see through the window what she was doing. She was sleeping! 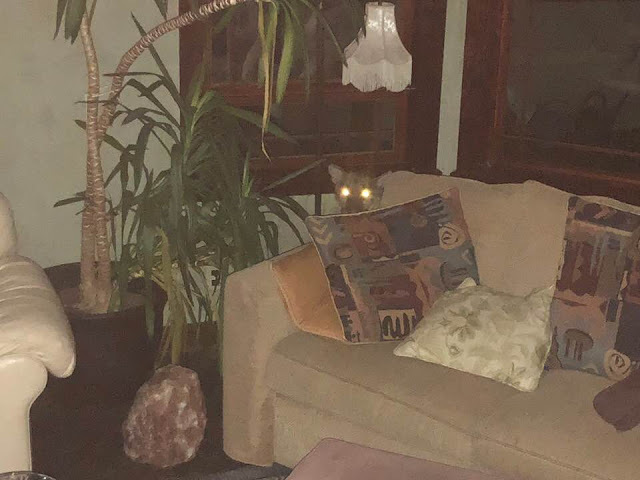 When I made noise, she woke up and looked startled so I consciously raised my frequency, gazed lovingly into her eyes, and communicated using feline-speak eye blinking to calm her. It was amazing to realize that this worked. I gazed lovingly then blinked hard and then she did it back! Then, she went back to sleep. This video taken by Taylor seems to show a sleepy mountain lion enjoying some rest time. When the animal woke up, Taylor wrote that “I again connected in a loving way,” and communicated to the animal through blinking. The animal, then, returned to her slumber. 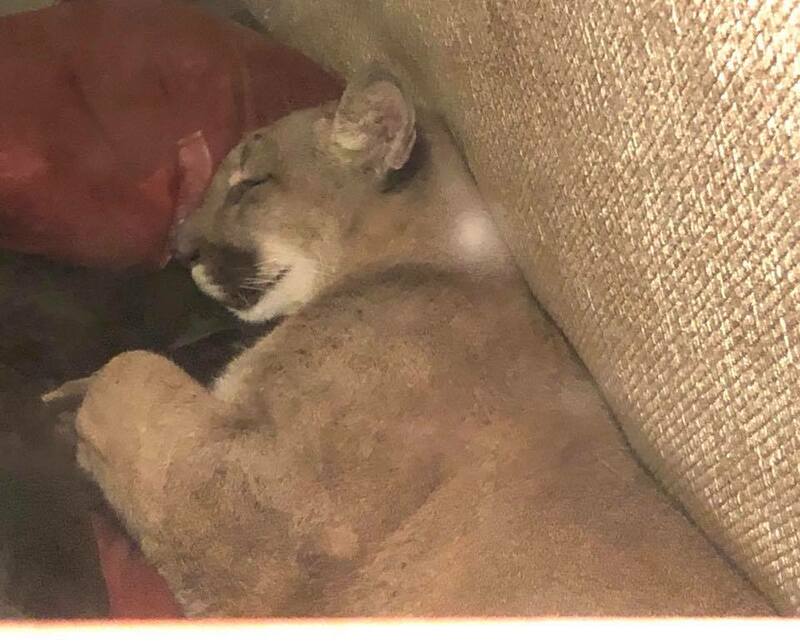 Taylor wrote that the lion slept behind the sofa for more than six hours. 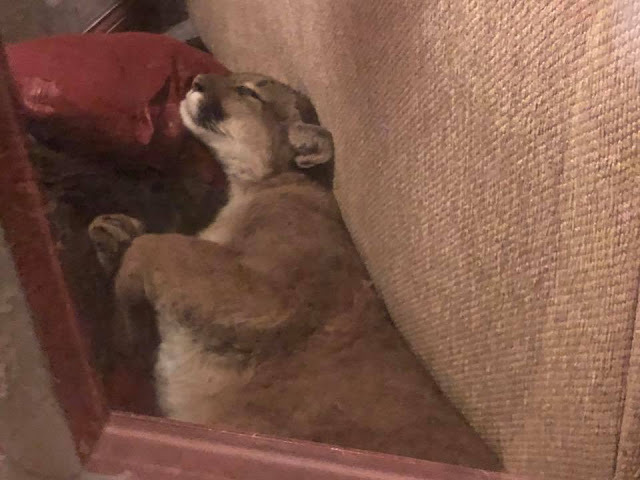 Here’s how Taylor said she got the mountain lion to exit the house. 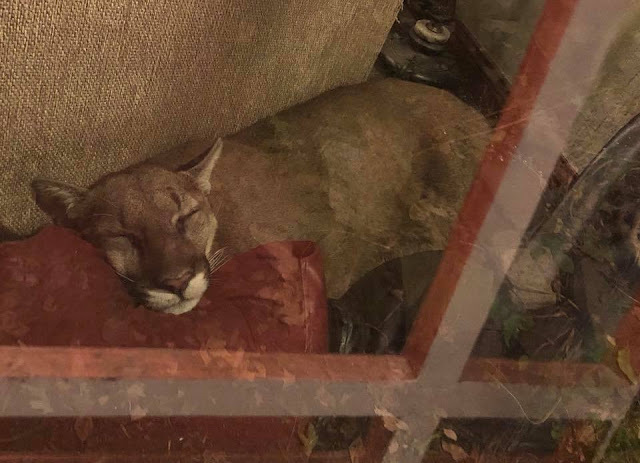 Read Taylor’s entire post here (and make sure not to invite any mountain lions into your home if you can help it). 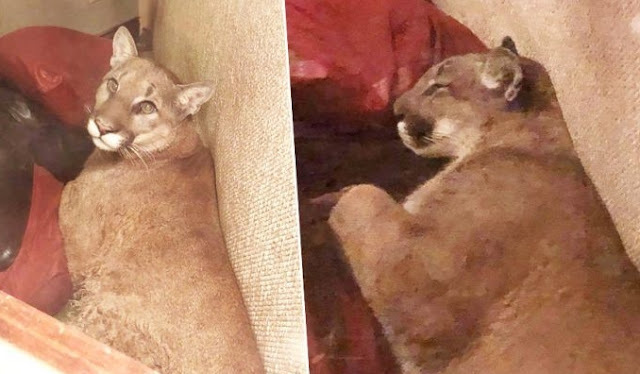 Responses to "A mountain lion invaded a woman’s living room—she used telepathy to calm it down "
That sweet creature. I wish more people were as attuned and open to calming and connecting to animals, rather than harming and scaring them. What a beautiful story. I did volunteer work at a true Big Cat sanctuary, with tigers, cougars, and lions. What this woman did really does work. Narrowing and blinking eyes is a sign of appeasement and works on domestic cats too. That shift in energy and thoughts sent to the cat does work as crazy as it sounds.